Doug Jordan is the senior pastor at Newlife. 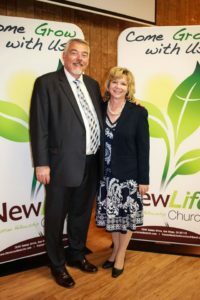 Doug brings to NewLife over 40 years of solid ministry experience. Doug specializes in helping each Believer focus on his or her personal walk and helping them know and understand the Bible and God’s desires for their life. Doug helps put the joy back in to Believer’s Christian lives through solid Bible teaching, meaningful heartfelt worship, encouraging fellowship, and helping Christians to be a bright light (testimony) to the spiritual needy in our community. Doug helps those at NewLife to know the “simplicity” of being a Christ Follower and helps them on their Journey to a New Life in Jesus Christ. For over 38 years Doug was involved at Lighthouse Baptist Church, one of the most thriving and growing churches in San Diego for many years. Doug served for 34 years as the Associate Pastor at Lighthouse Baptist Church along with his wife Jeanne who he met at Lighthouse. Doug and Jeanne have 6 children and 18 grandchildren. Pastor Jordan has worked in or led practically every ministry at Lighthouse, but with major emphasis on biblical counseling and the Lighthouse’s music director. He also served in the Juniors program (3rd – 6th) , Jr. Camp, Adult Sunday School teacher (Abundant Life Class), LBI Instructor, sporting events and couples retreat coordinator, and oversees the production of the Easter and Christmas holiday outreach programs. Pastor Jordan has also traveled with his family in the past doing evangelistic work, conducting marriage/family and music seminars. His family has recorded 8 conservative evangelistic music CD’s. Pastor Jordan has earned a BA and Masters in Theology from Sacramento Baptist College, a Masters of Arts in Theology & Theological Studies from Baptist Christian University, and classes in the Doctorate of Ministry program from Andersonville Theological Seminary with a marriage/family counseling emphasis.